How Can I Cope with Sending a Child to School with Allergies, Eczema, and Asthma? Today it hit me – my little boy will be starting school in the fall. In only three months he’ll be a preschooler, riding the bus and everything. He’s totally ready. I’m not. Will they get along with all the other kids? Will he eat something he’s not supposed to? If he does react to something will he get the correct treatment? Cream, antihistamines, Epi-Pen? Will the other kids accept his allergies or will they bully him? On top of all that, I’m worried about his eczema at school. Will he get an uncontrollable itch attack? Will the kids accept or make fun of his skin? When he catches the frequent common colds (for other kids) will it turn into an asthma crisis (for my son)? How often will this happen? Will he miss a lot of school? Will the germs and dust cause him to develop chronic asthma? I could go on, but you get my point. I know other parents have the same concerns and it’s wonderful to know I’m not alone and not crazy and over dramatic, which is how I often feel. Although I don’t know a lot about dealing with school AND allergies/eczema/asthma, I do know preparation and planning is key. It’s crucial to meet with school nurses and teachers before school begins to make sure everyone is aware of the medical needs of your child. Creating a well documented action plan in case of emergencies is essential. All medication must be approved in writing by the child’s physician. That is what I know. I can do all those things, no issues there. But, how do I deal with my emotions? I’m great at planning, but that’s not the issue. As a mom dealing with the atopic triad: allergies, eczema, and asthma, I’m constantly anxious about day to day exposures to triggers and irritants when I’m with son, how will I cope when he’s flown out from under my protective wing? Ultimately, I suppose I’m not that different from all parents in this regard. Every parent’s first day of school jitters comes down to the same thing – their child leaving their nest of protection, comfort, security, and love. So, how do most parents survive their child’s first few days of school? Emotionally, they probably don’t. I’m sure I’ll be a nervous wreck for weeks, but as parents we can only prepare our children so much before we set them free to discover themselves and to create their own identity. We have to place faith in our parenting up to that point and trust that our children will be smart enough to take care of themselves AND, when it comes specifically to allergies, eczema, and asthma, we must also do everything in our power to educate the teachers, nurses, etc. so we feel confident they will be able to take care of our children in our place. When school starts, our children really begin their own lives. We have to let them thrive and in order for them to do that, we have to put our own emotions and anxieties on the back burner. Below are some great resources you may want to check out before your child starts school. I’ll definitely be using some of this information when I meet with Tristan’s teachers and school nurse this summer. Protecting Your Child from Food Allergies at Preschool – How to select a school. Taking Your Child’s Food Allergies Back to School – Planning with the school. 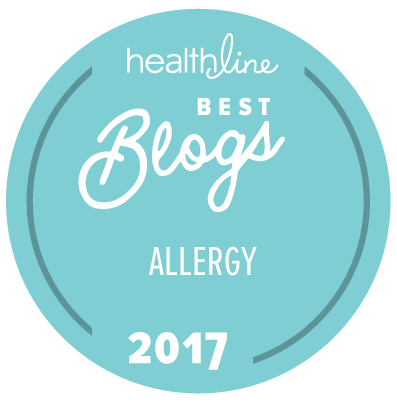 Emotional Aspects of Food Allergies at School – Two moms with kids in school discuss their concerns and review what they’ve learned so far. National Eczema Association (USA) – Tools for school – Educators and Parents versions. Great info here! Many of you have already been through this, having mastered the school-age parent role. How did you do it? What are your secrets? I’d love your input. Do you have any tips on how to deal with the emotional side of sending a child off to school? Or any tips on how you prepared your child for school? What kind of planning did you do with the teachers or nurses? Check back next week as Kristin Beltaos, a food allergy coach and consultant, gives us some tips on getting ready for school with food allergies. I JUST answered an email about this very topic! If you ever need tips that we have found effective over the years, I am always just an email away. As far as the emotional aspect for a parent, I can tell you that (honestly) for many, many years I did not sleep 2-3 weeks before school started and I would just cry. Not the best method but when you are stressed, the stress has to be released. I just made sure I did it away from where my son never saw me. I didn’t want to stress him out because of my insecurities. I can say that when we sent him to Kindergarten, we were so worried and he never even as much turned around to say goodbye. He ran off, happy to meet new kids and then we stared at each other like “What do we do for a few hours?” We spent the entire time wondering if he was ok, if he was safe. When we picked him up, he was smiling and happy. Class parties stress me out, snack time stresses me out and food projects stress me out. As long as you have constant contact with the teacher and other parents, you will be fine. As far as your worries with the eczema, that is something that you will have to just be very verbal with the teacher and (somewhat) be persistent. As always, never EVER worry about feeling as if you have inconvenienced someone else and placed your child in danger to make them feel better- ever! You are your own advocate for your child and the teacher does not have to like you, they only have to teach your child and keep them safe for the time that they are there. If you have a teacher that doesn’t seem to adhere to what your needs are for your child, discuss this with the Principal and ask if there is a teacher that will be suitable. This is not ideal but what’s better, having the possibility of a dangerous classroom for your child all year or worrying about what 1 person may or may not think about you. My vote will always be to keep my child safe, no matter what someone else thinks. I can also tell you, now that my son will be starting Middle School (goodness!) that each year does get easier with less stress, less strategy on handling the food/parties/etc and as the grades go up, there is less food involved. My best advice- it’s ok to be stressed, it’s ok to worry but be strong for your child so that they can be strong for themselves. He is technically old enough for kindergarten, but our local school system, while highly ranked academically and a great place for my older child with special needs, does not have a peanut policy and allows kids to bring peanut butter sandwiches to school. For the upcoming year I have enrolled my nut-allergic son in a private pre-K-3rd grade school that is a CRAP-TON of money. I’ve gone over the food issues with this school and am much more comfortable with how they are prepared for dealing with food allergies. Assuming this is a good experience, I will probably keep my son there until third grade, so that he is older and better prepared to fend for himself in the local public school. Sorry I don’t have a “it will be great!” story for you, but I agree, its totally nervewracking. One thing I found that you might want to reiterate to your child – any time any food is offered, they should say they have food allergies and decline or ask “did my mom check the label” (or whatever plan you have in place). My son initially would ask “is this safe?” – well, people didn’t always understand what that meant. In preschool, he would accept food from his teachers without saying a thing because, in his eyes, they know he has food allergies and wouldn’t give him anything that wasn’t safe. (We all know mistakes can happen.) Kindergarten was a much better year, though it was amazing how much food was a part of things….it was a reward, used in class projects, birthdays, holidays, celebrations, fun run days, bingo prize, star of the week option, etc. We worked with the teacher (who I ended up really appreciating and liking) and there was not a single problem. I wish there wasn’t so much focus on food, but we found a way to work through it all and my son had a great year. The other thing I found was kids sometimes touch other kids food. (UGH!!) My son brought safe popcorn for a movie day where everyone brought their own snacks. Well, he told me someone else had some of it (even though there is a no sharing rule). I asked if this child forgot their snack – no, they had goldfish crackers (which my son is allergic to). I asked if the other child washed their hands (no). Thankfully, there wasn’t a problem…but I had to teach my son that he shouldn’t share food and (if he does) to at least make sure the other child doesn’t have food allergies and has washed their hands. I also told him if anyone touches his food, he needs to stop eating it. Better to be hungry than have a reaction. This came in handy as someone eating an unsafe food touched his sandwich at summer rec day camp this year, and he wisely packed up his sandwich and didn’t eat any more of it. I was proud of him for doing that!! Finally, so much of Kindergarten is focused on listening/waiting your turn. I had to teach my child to be loud and clear (and it’s okay to interrupt) when he suspects an allergic reaction. I told him he doesn’t have to raise his hand, but he needs to go to the teacher or adult and say “I think I’m having a food allergy reaction. I need help.” – and if the teacher isn’t listening, he can walk out of class and get his epipen from his backpack and use it. (The teacher has a set in the classroom, and there is another set in the office, too.) I wanted to be sure he knew he would NEVER get in trouble for interrupting in an emergency, and class rules do not apply in these emergency situations. You have to tell them it’s okay to break the rules at times (when their life depends on it! ), because they are taught they have to listen and wait their turn and raise their hand….with 20+ other kids in the class, the teacher may not always see what’s going on or could say to hold on a minute if they are busy with another child. This scares me! The kids need to know they need to be as clear as possible, and to share right away if there’s a problem. During Preschool, we dealt with milk, peanut and egg allergies; during Kindergarten had milk, egg, pork and fish allergies; we’re heading in for further testing to see what 1st grade will hold, knowing he will have more foods to avoid. I’m not looking foward to this, but am encouraged that my son has grown up enough to help self advocate and understands that it’s okay to be different – we’ll “make up” for anything he misses out on after school (like get a slurpee or make something yummy), plus he gets to pick a really special treat from his alternative treat bag at school, too. Thanks so much for letting me share this piece Julie! Good luck with your link-up! I’d love to hear more eczema-specific school intervention, advice,planning. Hi Tracy – Definitely speak to your child’s teacher. My kids in pre-k and kindergarten had their own in class sink. We left a bar soap there in a case for my son to use only. This really helped his hands! Thank you everyone for posting this article. I am going through a lot of stress because my daughter starts kindergarten tomorrow, she will be taking the school bus to and from school. My daughter has the most severe kind of eczema, including on her scalp. She scratches a lot and I have to constantly distract her or remind her not to scratch which doesn’t always work. She gets terrible flare ups, she has fair skin that even a tiny bit of redness shows a lot. I hope she will manage to make friends and will not suffer from a low self esteem. I did however try to speak to the teacher just to let her know about my daughters condition although the day the teacher saw her was the day my daughter didn’t look so bad. Now after reading all your comments I am thinking of giving the school nurse a call and letting her know about her condition. I just pray day and nighty that my daughter could make it through. Did any one you ended up keeping your kids home during a flare up? And did everything go well in kindergarten? My heart goes out to you! By the time my son started school, we were lucky in that we’d already found our path to healing, so he never had a horrible flare up that prevented him from going to school. We did have to send him with special hand soap that didn’t irritate his hands, but the kids in the class never commented on that. My son has had to miss swim class when he was younger and he was covered in eczema – the chlorine burned him so badly and dried him out even more. And now that he’s older he loves soccer outdoors in the summer and played for a league this year, but it started in the late spring when his tree pollen allergy was in full force causing him to flare up behind the knees. If we covered that area, he was fine and his eczema didn’t flare up. But if we didn’t, then he’d get super pink and irritated back there. Let me tell you that he did NOT want to cover his knees as that made him look very different than all the other kids on the team and my son does NOT like to stand out. So, it was a battle with him for sure. In the end, he got to choose. So, it’s never easy. All we can do is help educate our kids and their friends and teachers and hope they can understand a little bit of what we go through and how to make our children feel as included as possible.